Writer/Director, Tom DiCillo’s [IMDB info] new blog chronicles his journey through the creation and distribution of his latest film, Delirious. The film is a contemporary fable about a small time celebrity paparazzo, Les Gallantine (Steve Buscemi) who befriends a young homeless man, Toby Grace (Michael Pitt). Toby meets and falls in love with pop star K’Harma Leeds (Alison Lohman), causing jealousy and friction with Les. (check your local listings – it’s really worth seeing it in the big screen). Screenplay – DiCillo’s idea for the script was motivated by the public’s addiction to celebrity and fame. He got the idea for the main character of the film after an encounter with a paparazzo in New York during the filming of The Real Blonde. The guy went into to the shot, trying to take a pic of Daryl Hannah – DiCillo almost strangled him. Years later, DiCillo ran into to this guy at a party; They hung out in NY and LA for 2 months and then he wrote the script. Casting – DiCillo wrote the lead role (Les Gallantine) for Steve Buscemi [IMDB info] but it took some convincing to get him to accept. Buscemi initially turned it down with concerns for the character’s redeeming qualities; DiCillo rewrote some aspects of the character and then asked Buscemi to come to a script reading; he accepted. For the Toby Grace character, the film’s financiers wanted a bigger star for the role. They threw out names like Justin Timberlake, Leonardo DeCaprio, Elijah Wood and Orlando Bloom (DiCillo lists the last two by their character names from Lord of the Rings). DiCillo “tricked” them into casting Michael Pitt [IMDB info] – the actor he really wanted for the role. Before Alison Lohman [IMDB info] was cast, Scarlett Johansen then Jessica Alba accepted the K’Harma Leeds role. Time passed and “their stars got too big.” The financiers then wanted a real Pop Diva for the role. Tom even wrote a letter to Britney Spears – no response. The celeb cameo by Elvis Costello [IMDB info] was turned down by David Bowie, Donald Trump, Sylvester Stallone, Paul McCartney. Financing – Peace Arch Entertainment financed the film for an estimated budget of $3 million (according to the New York Times, the original budget was $5M and DiCillo cut it down by $2M – so we can estimate that the budget was $3M). In order to get his final chosen cast accepted by the financiers, DiCillo had to cut $2 million off the budget; He says the only way to do this was by cutting 15 pages off the script – cutting down the number of shooting days. The Shoot – Principle photography lasted for only 25 days in New York. Frank DeMarco [IMDB info] was the DP. He’s indie writer/director, John Cameron Mitchell’s DP of choice. Michael Pitt’s last day before he flew out to Japan to shoot another film was shot on the Subway. With a hand-held 35mm camera, DiCillo, DeMarco and Pitt snuck onto the subway without a permit and shot throughout the night. + DiCillo shot the entire K’Harma Leeds music video even though they only used 45 seconds of it in the final cut. He wanted the whole thing just in case they would need it in editing; DiCillo also wrote the Pop song in the vid. + Stunt flies were used for one of the scenes; They had 3 flies: the first one flew out the door. The second didn’t move and the third one – their final chance to get the shot – did its job. The Edit – Shooting ended in December 2005; editing began shortly after the holidays in January 2006. 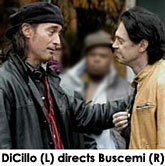 Due to the low budget, DiCillo had one editor and no assistant editor. They used the same editing room right after Sofia Coppola [IMDB info] edited Marie Antoinette; she left all her voice mails in the phone which they found amusing. They edited in a hurry in order to qualify for Cannes. Festivals – Even though they struggled to finish the edit for Cannes, Delirious was not accepted (Cannes rejected all of DiCillo’s films). He then submitted to Toronto. All of DiCillo’s films have been accepted to Toronto – until now. They passed. Then Venice passed. A day later, they got accepted in the Main Competition at the San Sebastian International Film Festival in Spain. DiCillo wins for Best Director, Best Screenplay and to his surprise, Grand Prize from the Catholic Church. On top of all that, he runs into the he head of the Sundance Film Festival – who declared, “We want Delirious for Sundance.” After Sundance, there was Istanbul (awarded a Special Jury Prize) and then San Francisco. Distribution – The film did not go through the normal distribution route. Along with being the film’s financier, Peace Arch also became its distributor – making Delirious its first theatrical release. DiCillo says that he may write about this relationship in the future. Exhibition – It started with 2 theaters in New York. After the first weekend, only one theater in NY was screening Delirious. There were/are a few others throughout the country but opening weekend success in NY and LA is essential for the film to expand to other territories. Not to mention that the business of your current project will be reflected on your next project’s ability to get financing. It was another story in France. Delirious opened in 70 screens – 11 in Paris alone. DiCillo tried to reason with the distributor to spend some money on ads during this crucial time. He begged the “powers that be” to take out one ad and not give up on the film. They took out a couple of small ads – that’s it.